Despite its long production run, the $2.50 Liberty Gold Quarter Eagle coin is one of the rarest US coins still available today. Its age is not the primary reason for its rarity, but rather the Great Depression. Today, the Pre-33 $2.50 Liberty Gold Quarter Eagle is now available from Silver.com. Individuals ship in plastic flips, multiples of 50 ship in plastic tubes. Contains .1209 ounces of .900 fine gold. Struck by the US Mint with $2.50 face value. Available in Very Fine condition. When the United States government collected all gold coins in circulation beginning in 1933, it created an instant shortage of gold coins minted before that date. The vast majority of the coins were collected and melted down into gold bars. The remaining coins are extremely rare and in demand among investors, collectors, and history buffs. Christian Gobrecht designed the images used on both sides of these Pre-33 $2.50 Liberty Gold Quarter Eagles. His inspiration was the Omni Vincit Amor painting by Benjamin West. On the reverse side of each coin is the image of a heraldic eagle. The eagle has a shield on its chest, and clutches arrows in one talon and an olive branch in the other. The obverse side of the coins bears the left-profile portrait of Lady Liberty. 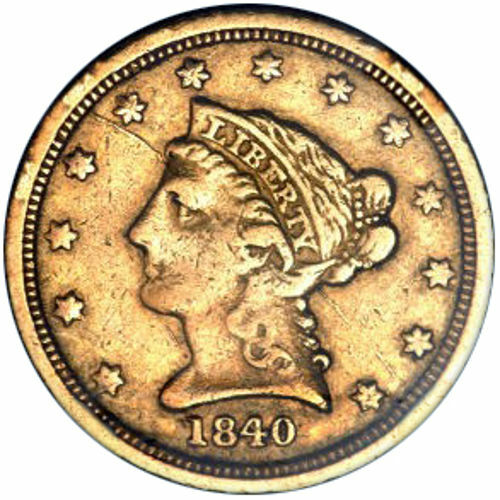 With the word “Liberty” inscribed in her crown, the year of minting is featured below and 13 stars encircle her image. Those stars represent the original American colonies. The coins in this product listing are available in Very Fine condition. Coins with a VF grade have light to medium wear, but all major design features remain sharp. Minor wear is visible on the finer details of the coin. 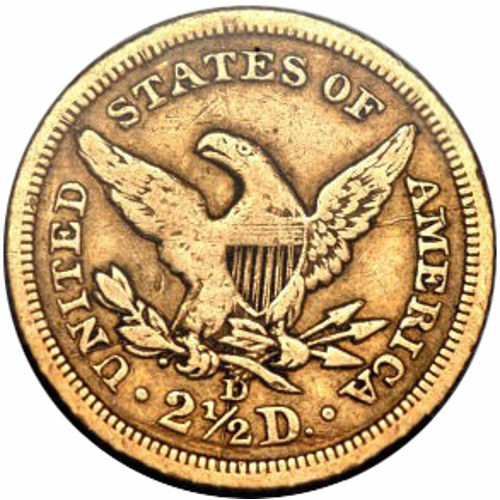 Pre-33 $2.50 Liberty Gold Quarter Eagles were struck by the United States Mint at its facilities in San Francisco, New Orleans, Dahlonega, Charlotte, and Philadelphia. If you have any questions about the coins in this product listing, we welcome those inquiries. You can reach a Silver.com associate on the phone at 888-989-7223, online through our live chat, or via email. Check out other Pre-1933 Gold Coins on Silver.com for related products.